For 2016, I have changed my analogue note taking system for the first time since I started using two Moleskine notebooks in 2012. 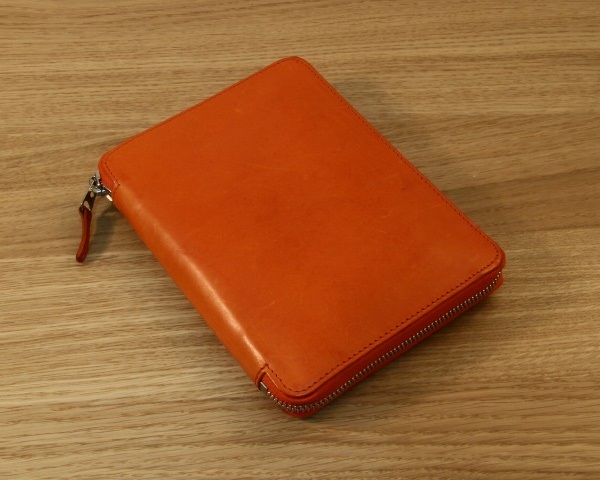 The centre of my 2016 setup is an Arts & Science leather case for the A6 Hobonichi Techo. I went for the bright option with this vivid orange, a colour which I often link to energy. It looks absolutely gorgeous and feels great to hold. When closed, the whole kit is a similar size to the dual Moleskine notebooks I used to carry. It’s a little shorter and wider, but generally, they feel to be around the same size in terms of having something to carry around. One of the benefits of using this case is that the whole thing zips up to keep the notebooks inside, nice and safe. This means that, rather than carrying two Moleskine notebooks and a pencil case, I can now just carry the single case with me every day. This is simply a snapshot of time at the start of 2016 while writing this article. 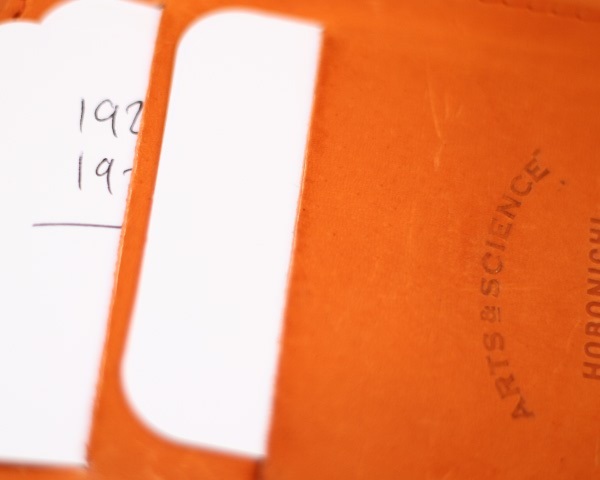 The items inside will change over the year, with the Field Notes changing at least monthly. Most times I’ll only have one Field Notes, but there’s a lot going on at the start of this year so I’ve started with two. Opening up the case reveals the notebooks inside. 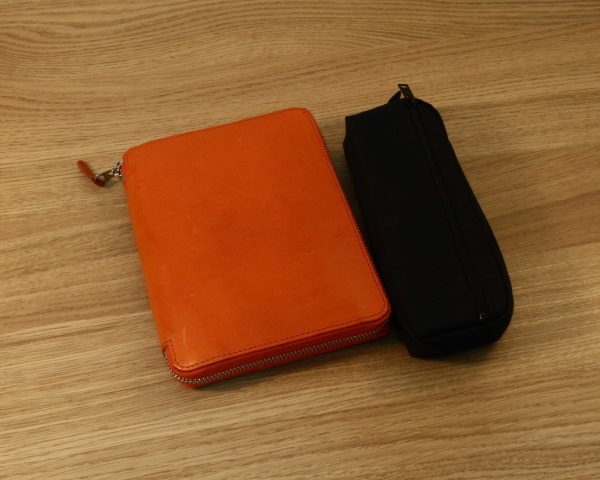 The Hobonichi Techo is on the right hand side, easy to open and look things up. I usually take it out when I’m going to be at a desk for hours, but I can also write and review various things directly in the notebook when it is still in the case. I will write some more about the Hobonichi Techo in a couple of weeks, but I mostly use this for time-based planning and daily journaling, rather than some of the more creative uses that the notebook is famous for. I do like to customise the outside though, and both sides are covered in stickers. 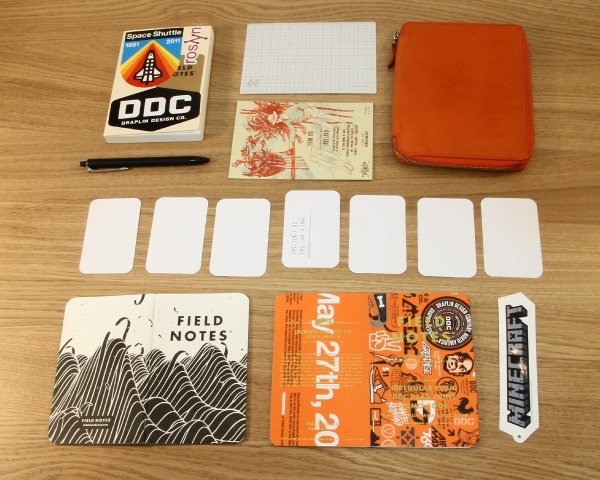 I fell in love with Field Notes in 2015 and now I use them for just about anything. 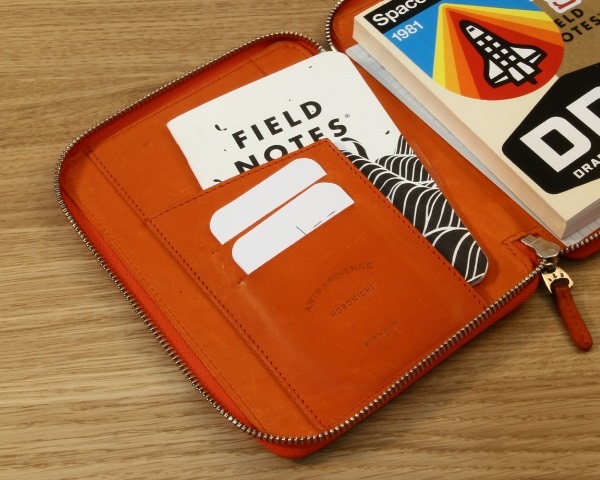 If I have only one Field Notes notebook with me, then I tend to put it in the left hand pocket as above. Since I am using two at the moment, I tend to just put them inside rather than stuffing the pocket. I also like to have a Band of Rubber on hand for if I need to hold them together. Anything goes in these notebooks. I burn through these books faster than anything else, and mostly they’re used to record current thoughts, plans and help support my longer term goals. 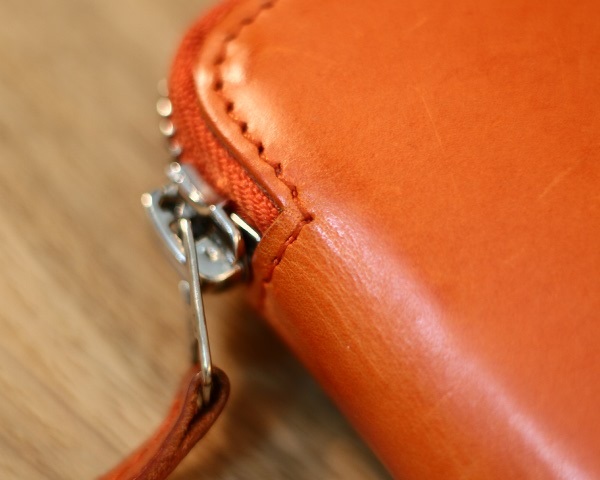 The pocket on the left also includes a couple of card slots. 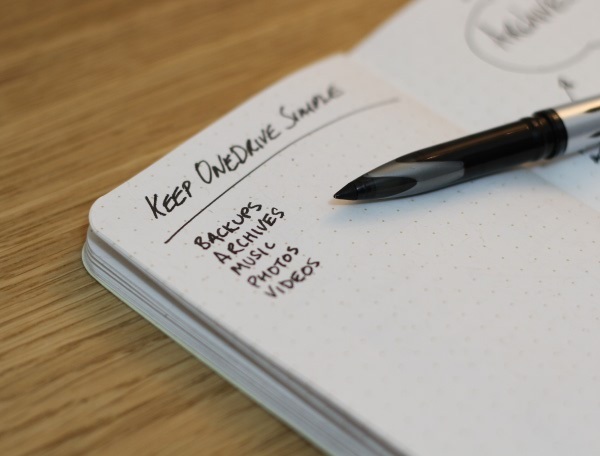 I use them with some blank, white note cards that are used for rough notes, ideas, and pretty much anything that I used to use index cards for – just in a smaller form factor. I don’t like to tear pages out of my Field Notes, so this is what I use if I need take a note for somebody else. I’ll write some more about my use of these cards soon, but I find that this form factor is much more useful to me than index cards. They easily fit in a wallet too. On the right, there’s a slot for a pen, and my current pen of choice is the Jetstream Prime (single version – I reviewed the multipen version a while back) with a 0.7 mm black refill. This has become by far my favourite go-to pen of choice, so it gets the pride of place here. Obviously, I am a huge stationery nerd and I can’t just have one pen, so I still keep a main pencil case, which I also carry if I’m using my work bag or something similar. It’s an optional extra though, so it’s not always with me. 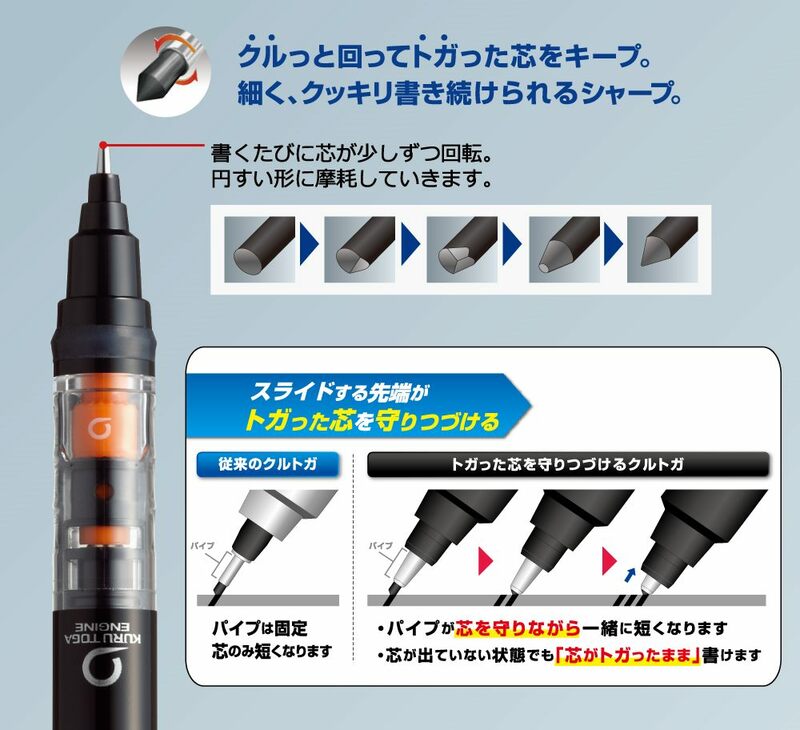 The Kuru Toga is favourite of mine and it still gets plenty of regular use. I’ve also found myself using the Uni-ball Air with large sheets of A4 to work my way through some ideas I have. I find it to be much more enjoyable than a Jetstream when working on a bigger scale or sketching rather than writing. 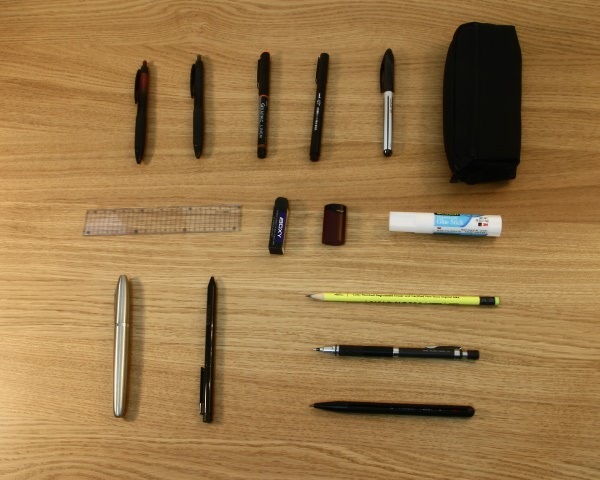 Most of the other items in my pencil case are going to change fairly regularly. I like to try new things so I often put pens or pencils in here for me to experiment with on a whim. 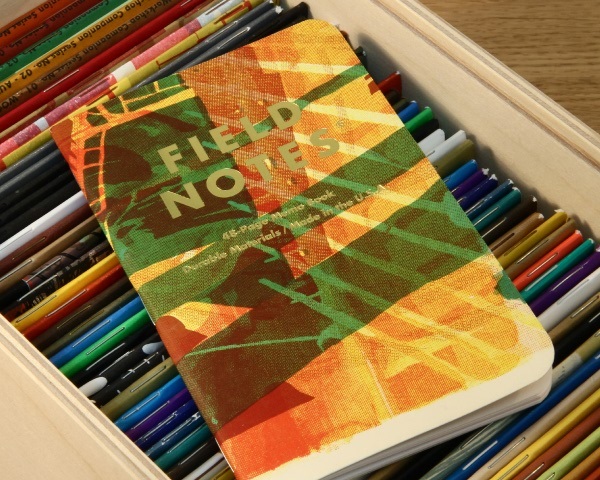 An example is the Field Notes No 2 pencil: it has been there for a couple of weeks, but I simply have not used it yet. There are a few other extras I often tend to use. 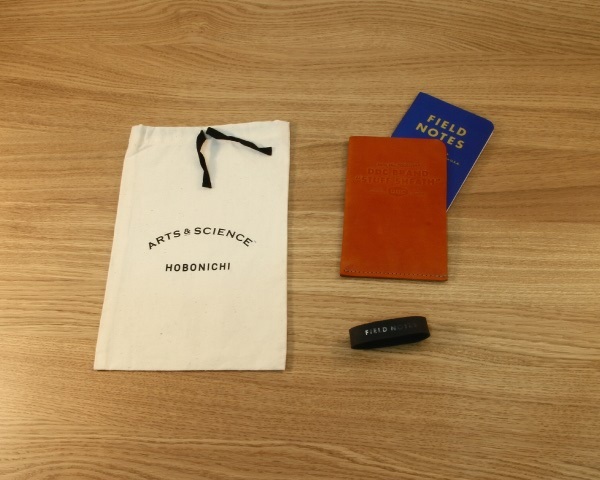 A cotton bag for the Arts & Science Hobonichi case, a DDC Stuff Sheath, and a Field Notes Band of Rubber – just in case. 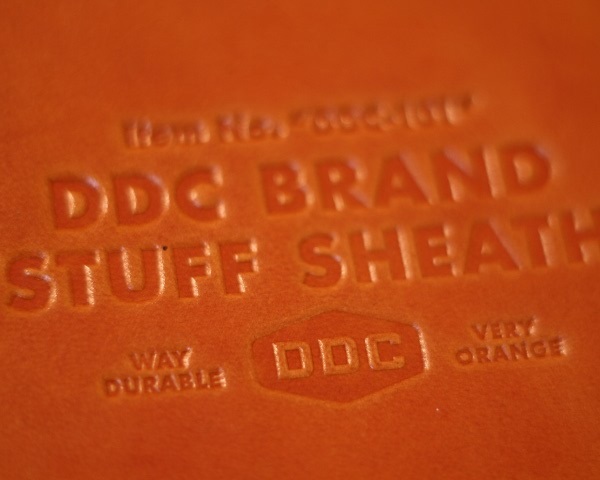 I regularly use the DDC Stuff Sheath when just carrying a single Field Notes notebook with me. It’s a fantastic little leather sheath that can be used for anything, but easily fits a couple of Field Notes and other loose materials. I have this on hand when I need it and often carry it with the Arts & Science leather case for my Hobonichi. They make a great pair. 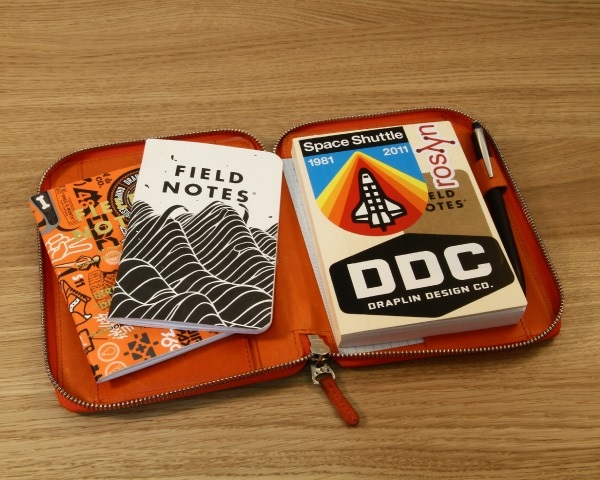 Like the pencil case, it’s an optional extra, but it’s most helpful when I am travelling or visiting somewhere and want to take a single notebook out with me. 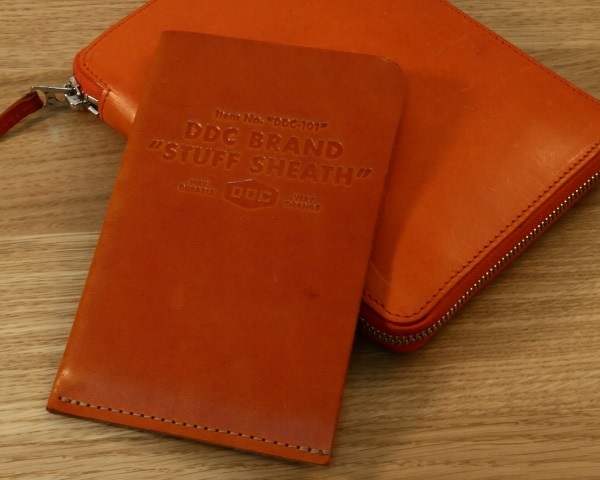 It’s way durable and very orange. Also worth a mention, is my seemingly never-ending supply of Field Notes notebooks. I keep these at home and choose a different one as soon as I finish the one I’m using. I love working my way through the many designs I have and I’m enjoying each one of the differences in paper and manufacturing techniques. These are the fundamentals of what I’m planning to use for 2016. It’s quite different to the way I worked before, but I feel that it allows me more flexibility and the ability to write more often with my analogue tools. 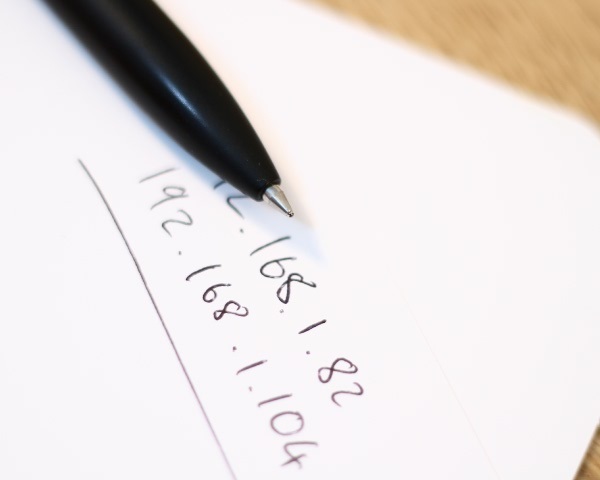 I feel more connected to analogue note-taking than I ever have. Follow @desk_of_jules on Instagram for more stationery photos! 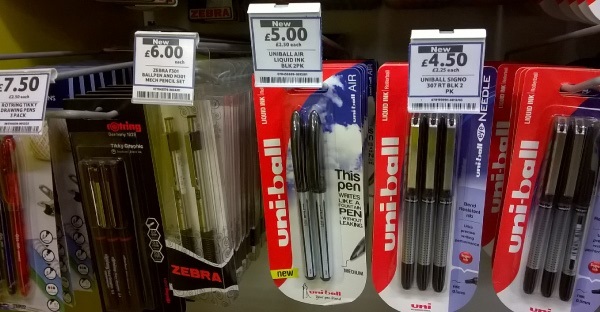 Last month, I was in my local Tesco and decided to have a look around the stationery section on the off chance that there was something of interest. I was extremely surprised to see a new, unfamiliar Uni-ball pen, since I’m pretty up-to-date on the latest products from the Mitsubishi Pencil Company. I don’t know how I missed this one, it has even appeared on a couple of the stationery blogs earlier this year. In my defence, the usual places I look for brand new Uni-ball pens are Mitsubishi Pencil’s Japanese website and on Jetpens, a US based reseller specialising in Japanese pens. At time of writing this, the Japanese website still didn’t have it (they just announced they’ll be available in Japan starting 26th of November 2015) and neither does Jetpens. Yet. 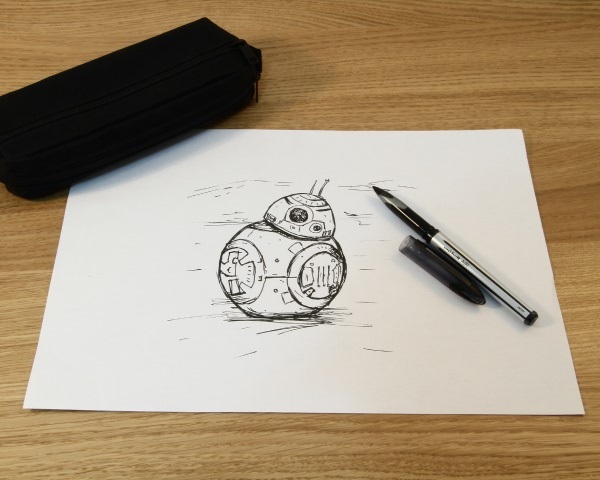 The Uni-ball Air is a liquid ink rollerball pen with a unique tip. The tip has stainless steel on the inside and is surrounded by a black plastic that gives it a distinct look and seems to flex with pressure, enabling the pen to write at more angles than the similarly-inked Uni-ball Eye series. 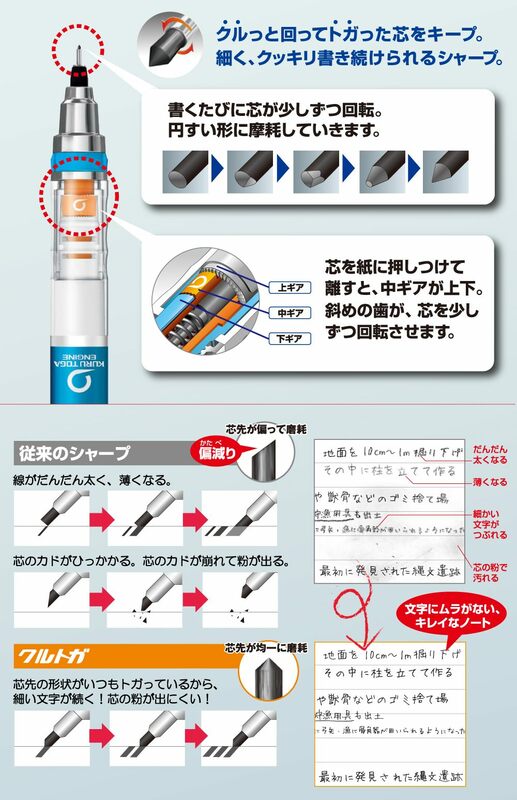 The advertising says that the tip gives a similar feel to a fountain pen (without the leaks), because you can get an effect where the line changes in thickness, depending how you hold it. 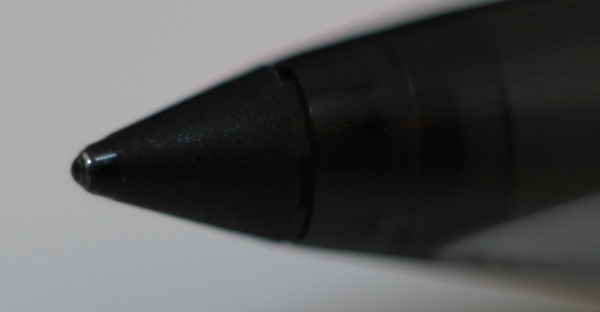 The tip has stainless steel on the inside, but it’s surrounded by a black plastic which gives it a distinctive look and also seems flex with pressure, enabling the pen to write at more angles than the similarly-inked Uni-ball Eye series of pens. 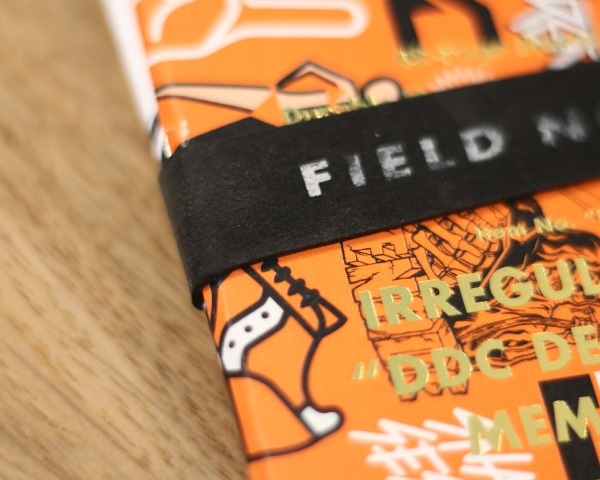 The thick black line has turned out to be a very good pairing with the Workshop Companion edition of Field Notes. I have enjoyed using it for sketching diagrams on large A4 pages, but for my usual daily note taking activities, I’m going to be continuing to use my 0.7 mm Jetstream Prime for now. I love Jetstream ink too much to give it up. The Uni-ball Air has made it into my pencil case and will be used as an option whenever I want to use this kind of ink. However, I hope to acquire a thinner version in the not-too-distant future, so that I might have more opportunities to use it. By the looks of it, the version you get in the US is actually thinner and, in my opinion, better looking. I’m not keen on the stripes they’ve given us in Europe. Why are they even different? I find it interesting that it came out in the US and Europe first. In fact the slogan they’ve been using on all of their international sites is “West meets east“. It certainly seems like it was released in the West first, for some reason. As a final thought, I’d like to say that I’m pleased to see Uni-ball are still innovating. They are my favourite pen and pencil manufacturer and I often worry about their lack of new designs in rollerballs and ballpoints. I’m essentially using the same type of ink refill I was using almost a decade ago. The Air feels like something different to their existing line-up, and that’s good. 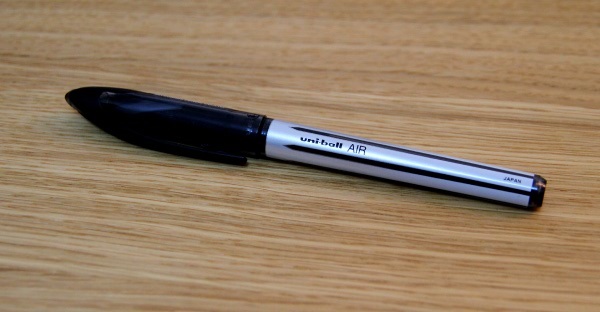 The Uni-ball Air is now listed on the Japanese website, and it looks like they have the same designs. The broad ‘stripy’ version, and the cooler black version. 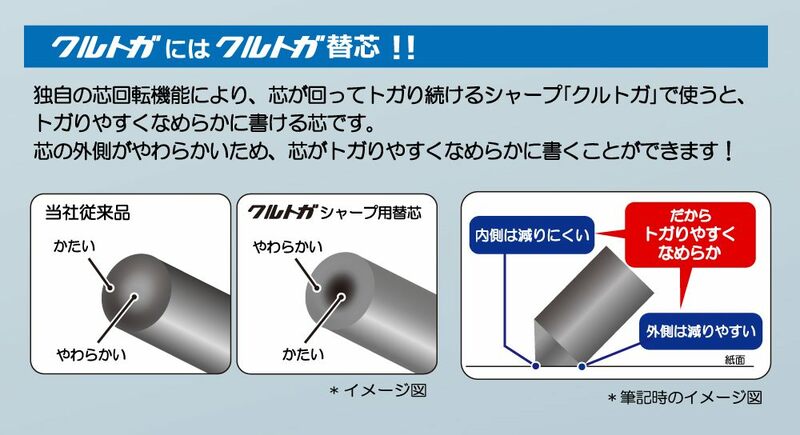 The black version is shown with ‘micro‘ branding on the side, and is 0.5 mm. Hopefully I’ll be able to get one soon!